It’s been a long day, most of it spent on the road. I just got back at 9:00pm. I took the first batch of chickens to the processor in St. Charles, MN this afternoon. 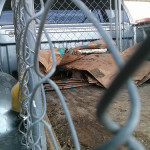 I used this little carrier I made out of a sheet of plywood, some chain-link fencing that used to be a dog kennel, and a piece of a cattle panel. It oughtta work fine for 60-75 chickens. 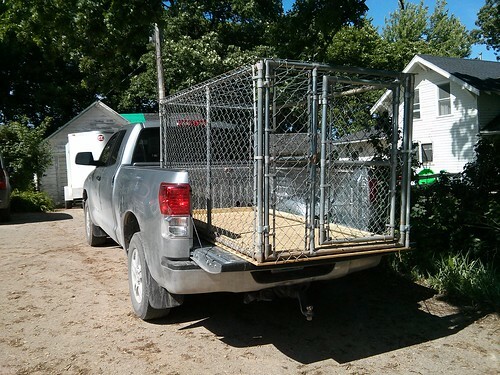 It makes for much better gas mileage than hauling a big livestock trailer. Turns out it works pretty well for a few little pigs too. 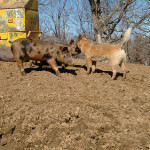 Meet the first official Green Machine Farm breeding pigs, both girls (that’s gilts if you’re into pig-speak). They’re a bit small at this point, only 40lbs, but they’re pigs which means they get big in a hurry. 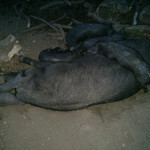 They’re Large Black Hogs, and I had to drive over to Osseo, WI to pick them up from the fine folks at Pasture Prime Farm. 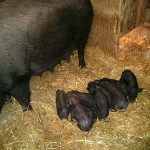 I’ve wanted large blacks for some time now, especially after seeing them at Green Acres Farm this past winter. They’ve got a lot of the characteristics I’m looking for: foraging ability, docility, good mothering and long “bacon-type” carcasses. The fact that they have a “critical” status from the ALBC is just the icing on the cake. After a brief consultation with my wife, we’ve settled on a naming scheme centered on the best band ever: The Drive By Truckers. So, welcome to the farm Margo and Trixie! 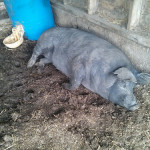 Any guesses on what the future boar’s name will be? I must say Andrew, you come up with some pretty good ideas. Thanks Gordon. I hope they can be of use to you or someone else. 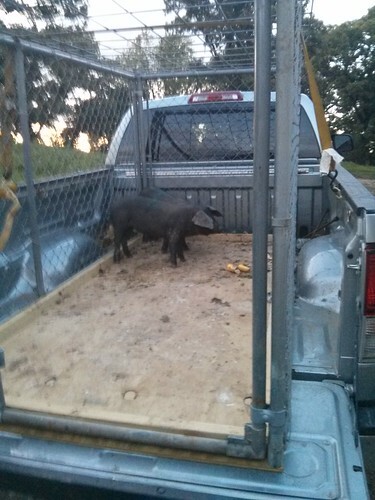 Do you plan on the boar being of the same breed or are you looking to cross? I’ll be crossbreeding them, I’m just not sure what they’ll be crossed with just yet. Something with a bit more muscle and faster growth.